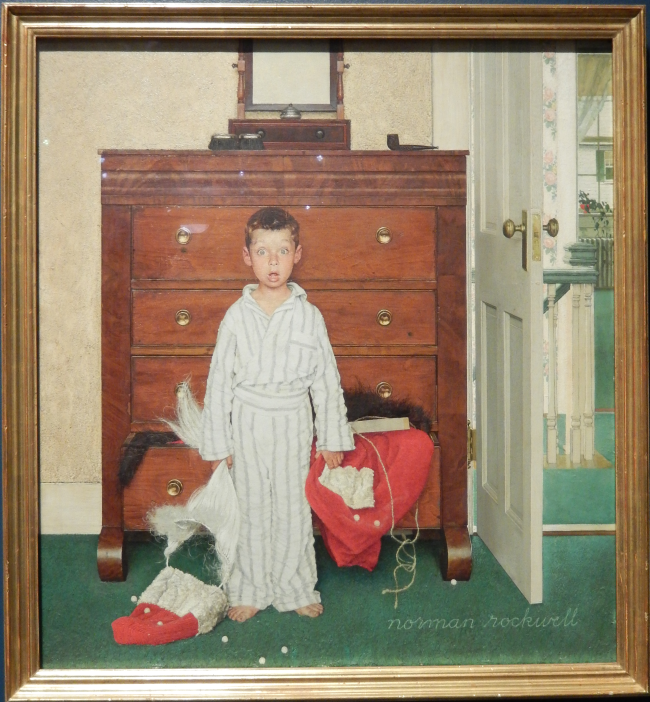 I knew there was a show of Norman Rockwell paintings going on at Newark Museum. And it is something I definitely wanted to go and see. But you know how it is… oh, the show is going to be there for a long while… I can go anytime. Then, I get this email from Newark Museum that it is the last three days of the show. No more postponing… I have to go right away. And that is what I did. Boy, am I glad I went! It is such an awesome show. 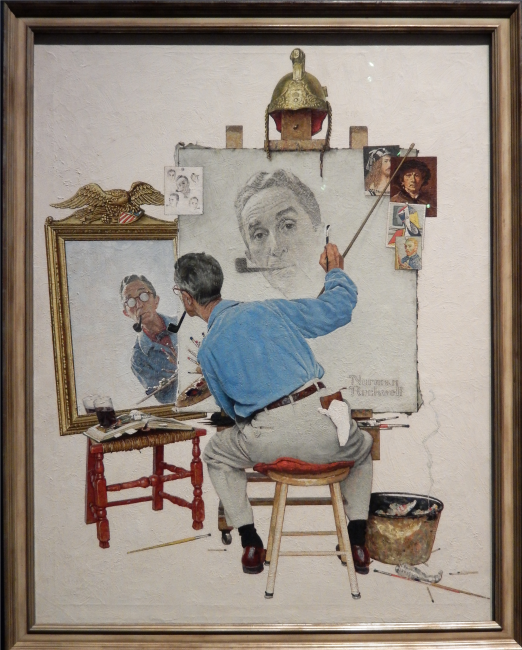 Norman Rockwell was an artist who captured the best in American life, through his paintings of everyday scenes. According to him, the commonplaces of America are the richest subjects in art. 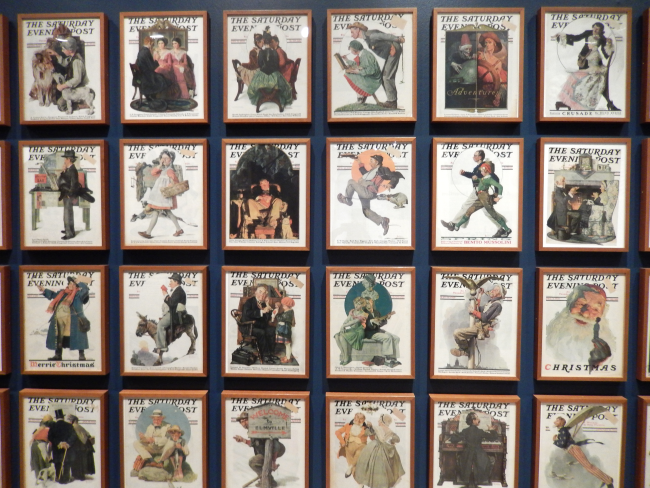 Starting his artistic career at the age 19 as the art editor for Boys’ Life, the official magazine of the Boy Scouts of America, he has worked for publications like The Saturday Evening Post, Look, Ladies’ Home Journal, Literary Digest, and Life. 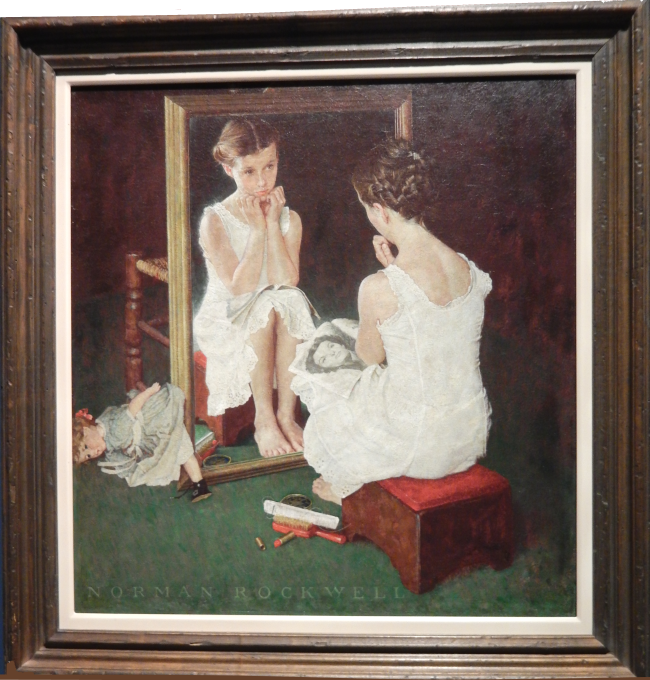 What is so endearing about the Rockwell works is the innocence of the characters depicted. Be it the boys indulging in very boy-like games or the young girl preening herself in front of the mirror, or the young soldier trying the few French words he knows on a little girl in France, they all show a guileless side of humanity. Looking at his paintings, viewers will be tempted to reaffirm their faith in humanity, overcoming all cynicism. All you see in those paintings are the small joys and celebrations of life, every day scenes that bring a smile to your face. These are not works that you look at and move on; these painting will hold you to the spot, wondering at what you are seeing. Each of them has a story to tell, that too in minute detail. There is so much to see in the paintings that you could see them again and again, and keep noticing new details. And these are the stories of everyday American life. So much so, that one tends to think of a day to day idyllic scene as a ‘Norman Rockwell moment’! That is how much he has become a part of the American art scene. For such a prolific artist whose concentration on his work was all-absorbing, he was also very organised. He will take multiple photos with models – often people from his own circle, including family members – and prepare meticulously to capture the exact scenes and emotions he wanted. He was also extremely careful in keeping his studio clean to the point of fastidiousness; his studio was swept and the paint brushes cleaned with ivory soap four to six times a day! 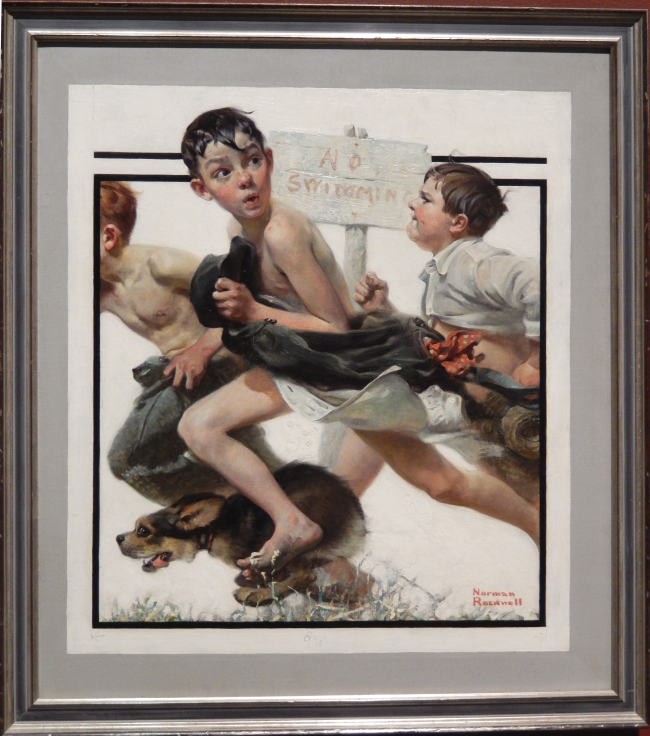 Movie legends George Lucas and Steven Spielberg are big time fans and collectors of Norman Rockwell’s art. 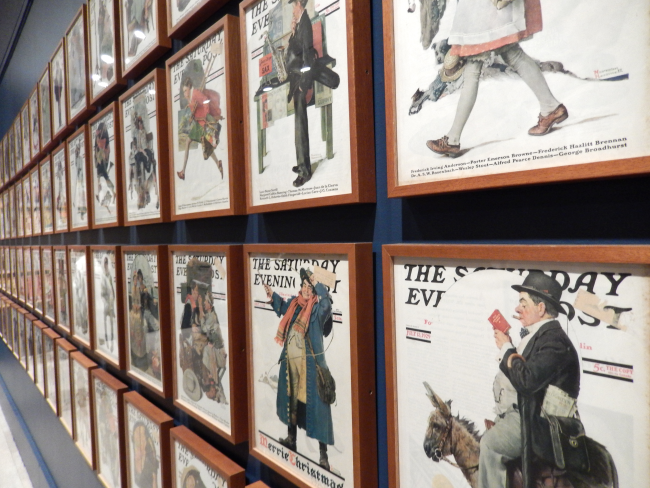 The Smithsonian American Art Museum in Washington D.C had held an exhibition, ‘Telling Stories Norman Rockwell from the Collections of George Lucas and Steven Spielberg’ in 2010-11. 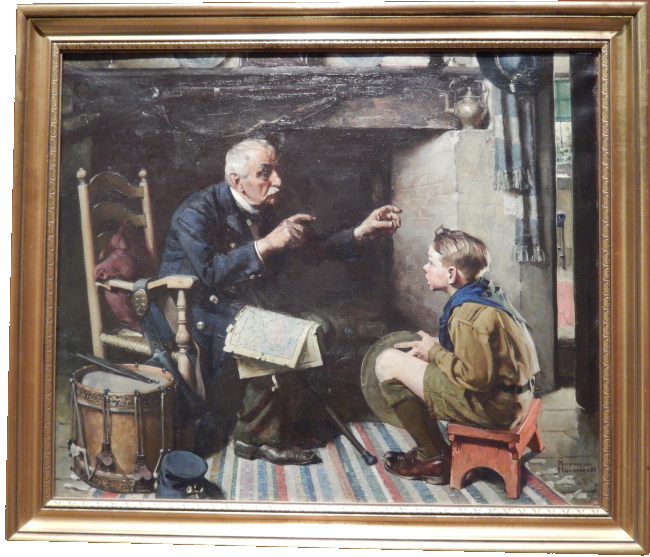 Norman Rockwell was a very unassuming person. He claimed to be an illustrator rather than an artist. And when asked how much he was being paid for the covers he did for Saturday Evening Post, he response was, ‘twice what they are worth’! In that connection, it is worth mentioning that one of his paintings titled, ‘Saying Grace’ sold for 46 million in an auction in New York City in December 2013. I wonder what he would have said to that!